How to choose the right pergola? How to choose the right pergola for your home? If you want your backyard to have a little extra charm, pergola is the way to go. A pergola can create a defined space for outdoor entertainment and relaxation and additionally can give your home a more stylish look. This can be the shaded area beside the pool, or a centrepiece for your garden, or simply a sitting area where you can just chill, but there is no way of denying the appeal of a well-built pergola. To ensure its full functionality you need to choose the right pergola keeping how you want to use it in mind, and sometimes it can be overwhelming considering the array of options available in the market and budget constraints. Here are a few issues we want to draw your attention to so you can have the perfect pergola built for your home. Let’s run a quick check on your outdoor. Go outside and look at the existing outdoor space. Make mental notes on what you like about it. This list can help you a lot in deciding your style preferences. Is there a garden featuring in your front/backyard? If there is, is it neatly trimmed or intentionally kept rambled? Do you have a patio/deck? If you have, is the patio space defined or there is established walkways? Which style do you prefer? Rustic, country styling or modern sophistication? Do you want your pergola to be freestanding or attached? Answers to this questions can point you to the right pergola style. For example, the waves of arched pergolas go better with a rambled style garden, whereas a simple, straight pergola suits tidied up garden more and gives it a modern feel. How will you use your pergola? Considering the use of your pergola before you decide on the style is mandatory. Think if you want the space under pergola to be a place for morning relaxations or you want it to accommodate people for backyard barbecues or dinner for two. If you are planning on using it for many recreational activities, you might need a larger pergola. If you want it mainly for the ‘me-time’s, you might consider draping it with vines so you can have a bit of privacy along with shade. If you want an outdoor kitchen, you will need additional space. For those who love stargazing, an open style pergola will do the trick giving the best view of the sky. When it comes to choosing the material and colour for your pergola, fortunately there are many options available in the market. Pergolas come in different materials like steel, timber, vinyl, aluminium etc. each having its own benefits in the matter of durability, and you can customise it with the colour of your preference. For a balanced, cohesive look for your outdoor, you need to consider the size of your pergola too. Generally, the larger space you have, the larger the pergola can be. Also consider the size of other building and structures in the area. For example, if you have a small pool area, you don’t need a big pergola in the same area. How much shade do you need? 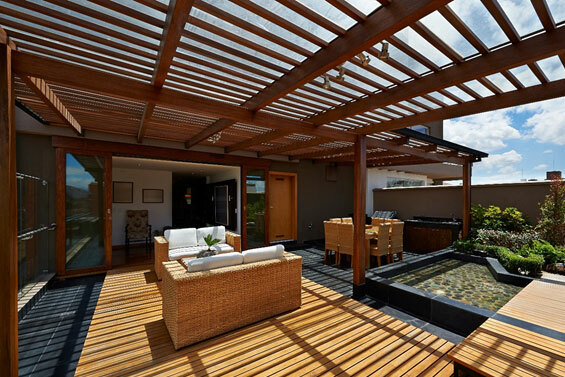 The amount of shade provided by the pergola depends on how closely the angled slats are spaced on the pergola roof. If you want to create more shade, choose one with closely spaced slats. Also, there are louvered pergolas where you can adjust the slats whenever needed. With proper skill, effort and time you can undertake a ready-to-assemble pergola project, but if you want a customised pergola with proper finesse, hiring a professional will be the wise option. Professional builders know how to do the job efficiently and properly, also they will understand local regulations and will provide a warranty of their work. Is there any feature in a pergola that you specifically prefer to have? Think about the roof shapes, the posts, the added privacy or any other feature you would like in your pergola and share it with the builders. Who doesn’t want to fulfil all their dreams without any budget constraints? Unfortunately the villain always appears in the fairy-tale. So, before undertaking any project, you need to make a proper plan so you don’t lose track of the money spending. Have a chat with an expert and learn about the costs for specific designs and specific additions, only then you can get an idea of how much to spend and where. MTB Carpentry & Construction has the experience and skill you need for your dream pergola project. Feel free to have a discussion about the right pergola suited to your needs with our experts, they can give you the best advice, provide free quotes and a high quality service at competitive prices.